What’s the Best Age to Take Kids to Walt Disney World? Note: This article was written by one of our readers Leigh. Click here to learn more how to contribute to this blog. Sooner or later, many moms and dads decide it is time to take the family to Walt Disney World. Perhaps you’ve been dreaming about that special family vacation since before you even had kids. Or maybe your kids are older and have been begging to go to Disney World for years. Either way, going on a vacation to Walt Disney World is no easy feat. It takes time, planning, and, well, an amount of money that is a pretty significant part of many people’s budgets. But, the rewards of a Disney World vacation are huge: Fun for everyone, and priceless family memories that will last a lifetime. 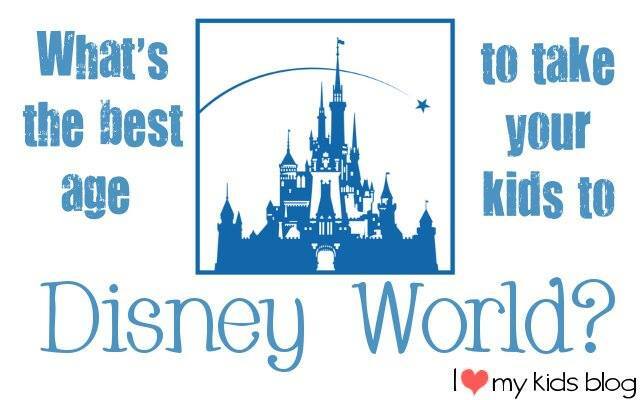 If a trip to Walt Disney World will be a once-in-a-lifetime thing for you, how do you decide what’s the best age to take kids to Walt Disney World? There’s no right or wrong answer to that question, unfortunately. It really depends on your family’s priorities. First, know that there is no “wrong” age to take a child to Walt Disney World. There is truly something for everyone to do at Walt Disney World, and the resort is well equipped for helping moms and dads handle even the youngest infants there. 1. If you want to vacation at Walt Disney World during a time when your kids will most believe in the “Magic,” then preschoolers or young school age children, say ages 4-7, are ideal. Those are the ages when seeing Mickey and Minnie will be magical, when princesses are real, when the shows will be the most enthralling for them. 2. If you want to vacation at Walt Disney World when your children will really remember details of the experience forever, then taking them when they are older children is a good choice. Think about vacations you really remember a lot about. My very vivid memories of things start at around age 8 or 9. 3. If you want to vacation at Walt Disney World to get quality family time you aren’t getting at home, then going with your teens will be great. Everyone lets loose and has fun at Walt Disney World. If you find your family pulled into a million different directions at home with work, activities, and general, well, teenaged-ness, then taking a few days to stop the madness and go someplace that will be fun for everyone is a great way to reconnect. Of course, you and your kids can go on multiple vacations and take advantage of all of these different “stages” of experiences at Walt Disney World, too. And, fair warning: After you’ve gone to Walt Disney World once, it’s pretty likely you’ll want to go back again. That “once-in-a-lifetime” trip turns into a once a year vacation for many families. All four of our boys got to go to Disney World for the first time for their 6th birthday. We found that age 6 was the perfect age. They were old enough that they didn’t tire easily, and they loved all of the characters and age-appropriate rides. They were also old enough to understand that they had to stick close to Mom and Dad, and we didn’t have to drag a stroller around.